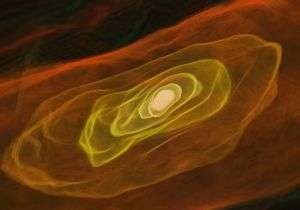 (PhysOrg.com) -- In the beginning, there were hydrogen and helium. Created in the first three minutes after the Big Bang, these elements gave rise to all other elements in the universe. The factories that made this possible were stars. Through nuclear fusion, stars generated elements such as carbon, oxygen, magnesium, silicon and the other raw materials necessary for making planets and ultimately life. “In order for us to follow the chain of events responsible for how we got here, we need to understand the beginning,” said Daniel Wolf Savin, a senior research scientist in Columbia University’s Astrophysics Laboratory. The work of Savin and his collaborators, who include lead author and former group member Holger Kreckel, now at the University of Illinois, will be published July 2 in the journal Science. Savin’s research details a key chemical reaction that took place in the universe about a million years after the Big Bang. That reaction, called associative detachment, allowed clouds in the universe to cool, condense and form the first stars. “In order to understand how the first stars formed, we need to know how the clouds that gave birth to them cooled. Molecular hydrogen (H2) radiated the heat out of the clouds, so we need to know how much H2 was in the cloud. This in turn requires understanding the chemical process by which the H2 formed. That’s what we’ve measured,” said Savin. H2 is formed when two hydrogen atoms come together and bind to one another to make a molecule. Savin’s group measured this probability. His results show that the likelihood for this is higher than previous theoretical calculations and experiments have shown. The predicted masses for the first stars depend on the initial conditions of the primordial clouds from which they formed. These conditions are highly uncertain and still an active area of research. By comparing model predictions to observations of the universe astronomers can approximate what these initial conditions must have been. But the accuracy of these estimates depends critically on our understanding of the underlying chemical reactions, particularly those measured by Savin and his group. With the new data in hand, cosmologists will be better able to determine what the initial conditions were in the early universe leading to the formation of the first stars. And then science said "just kidding!". And then really did it. Nuclear matter is dissociating into smaller fragments, not fusing together! The Sun and other stars are generating Hydrogen and discarding it! Measurements show that our own Sun discards 50,000 billion metric tons of Hydrogen each year! For details, see "Earth's heat source - the Sun"